Our Alter-G anti-gravity treadmill helps us treat many different complaints ranging from muscle strains and ligament sprains to joint replacement rehabilitation and weight loss. It allows our patients to recover and improve at a much faster rate with minimal stress on the body and injury. A lot of our patients use the Alter-G to help with osteoarthritis, post joint replacement rehabilitation, weight loss, muscle and ligament rehabilitation. This is a NASA designed and patented piece of equipment allowing clients to start patial weight bearing exercise a lot quicker than conventional methods. The device can take your body weight down from anywhere between 100% to 20% of its norm allowing knee replacements, ankle sprains, arthritis, muscle strains and many more ailments to exercise pain free with minimal impact to the joints, enhancing and speeding your recovery and well being to the max. It is also great for weight loss, allowing you to work at your target weight, easing the pressure on your joints. 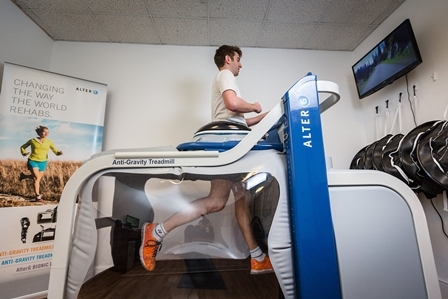 Unlike hydrotherapy where the natural gait pattern changes, the anti gravity treadmill keeps the norm gait movements allowing a much more precise and specific rehab. With hydrotherapy it is hard to apply a specific body load and can take no more than 40% of your body weight away, with the Alter-G, you can set your body weight anywhere between 100% and 20%, allowing you to gradually rehabilitate and add body weight for gradual improvements. Currently only 12 available for use in the whole country.